Nebraska Giant Bow Buck, 196 Inches! 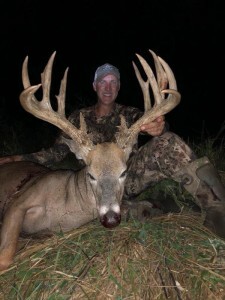 Andy Morgan, co-host of American Archer on Outdoor Channel, shot one of the largest whitetails ever on film with bow and arrow last week in central Nebraska. The giant green-scores 196 5/8, and is believed to be at least 7 years old. Morgan, from Dayton, Tennessee, has been hunting Nebraska for 15 years. He encountered this buck as a 3-year-old, but passed on him. Andy didn’t see the deer for the next 3 years, and thought he was gone. But the giant popped up on a trail cam earlier this year, and he knew immediately this would be his target buck for the 2018 archery season. Andy got his opportunity a few days ago and capitalized. He shot the buck at 46 yards from a tree stand he had hung just a couple of hours earlier. It was a perfect double-lung, and the deer ran 200 yards before dropping. Takeaway: The best way to kill a big deer sometimes is to go on sneak attack for a quick-strike ambush. If you have evidence a buck is walking in daylight, don’t be afraid to go in, hang a stand, and hunt right then and there, like Andy did for this giant. Way to go man, great job and awesome buck. This entry was posted in Big Bucks, Big Deer TV, BigDeer, Bowhunting, Deer Hunting, whitetail deer by admin. Bookmark the permalink.